Rehearsing of a Nest is an installation made as a result of the collaboration between Noriko Mitsuhashi and Sato Endo during their stay at Het Wilde Weten from April till November 2010. In the studio of 7m x 5m x 4m, Noriko Mitsuhashi and Sato Endo has constructed a corridor and a niche. The visitor walks into the construction and experiences a transformation through their physical relationship to the space. 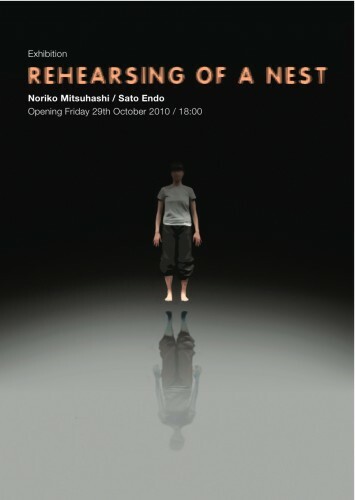 Rehearsing of a Nest is a device which starts up the visitor’s imgination through the kinesthetic sense. On Saturday, Sato Endo presents her working process. In ‘Rehearsal’ Sato researches the relationship between the performer Keyna Nara and her pre-recorded video image made by Bas Noordermeer. The images were taken during one of the rehearsals while Keyna improvised movements. In the presentation, Keyna goes into a dialogue of movement with these video images. How does she relate to the images of herself from the past, what impressions does she receive and how will they have an output in her movements and actions? The presentation is an open rehearsal and takes place from 15:00 till 16:00. The audience can walk in and out as they want, and it is welcomed to tell impressions to the maker after the rehearsal. Noriko Mitsuhashi (NL / Japan) Noriko uses a variety of materials and techniques to expand her theme of human relationships. She graduated in Combined Media Course, Chelsea College of Art and Design in London and worked as a research associate at Tokyo National University of Art and Music in Intermedia Art.